It is the exam season – and that doesn’t just apply to the studious youth. The same can be said of the world’s top golfers as they ready themselves for the tests that define careers. From the moment the US Open tees off on 13 June, the players will have just 60 days to emulate Masters winner Adam Scott and make their year with a major title. In the most intense and important spell of the golfing calendar, the Open and PGA rapidly follow 2013’s second major, which will be staged at Merion next week. And worryingly – from a European point of view – there is little ground for optimism after a largely disappointing year so far. For Rory McIlroy, Luke Donald and Lee Westwood, the predicted grades are modest at best. None of these recent former world number ones has shown form to suggest any of them will emerge top of the class in the papers that count the most. McIlroy’s search for the level of performance that made him the game’s dominant figure last year is growing ever more desperate. He insists his best form “doesn’t feel too far away”, but his finish at last week’s Memorial Tournament – where he tied for 57th place – was another depressing return in what has been a winless season so far. The 24-year-old from Northern Ireland has struggled to maintain his concentration this year, while self-confessed ruinous errors have undermined far too many of his scorecards. 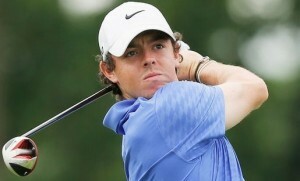 McIlroy admits there is “something up” regarding his management company, with whom he appears to have split. Neither party has commented publicly. The player insists the situation is not adversely affecting his golf, but performances like his first-round 78 at Jack Nicklaus’s tournament last week suggest otherwise. This week he makes a revision mission to Merion in order to ready himself for the US Open in the knowledge that he will need a clear mind to contend. Of course, he has the comfort of two majors to his name at a very tender age. He can afford a barren year at the game’s biggest championships more so than many of his other European rivals, as he has plenty of time on his side. The same can’t be said of the 40-year-old Westwood, who seemed to suffer a hangover from his poor finish at the BMW PGA Championship with a miserable missed cut at the Memorial. Whatever spin the Englishman, who is now based in America, puts on that performance, it has to go down as a badly missed opportunity. He went to Wentworth confident and nothing suggested the optimism was ill-founded – until his game collapsed after leading by two with 13 holes left to play. It is tempting to feel more mental scars will have been imparted on a player who has seven top-three finishes in majors, but no victories.